The Recon Ruck challenges participants to cover 19.17K or just under 12 miles through Quantico's hills, trails and roadways. Happening on the same day as Run Amuck, the Crossroads Challenge and the Belleau Wood 8K, the Recon Ruck presents a new way for motivated individuals to participate in the MCM Event Series. The Recon Ruck begins and finishes at Butler Stadium. The Recon Ruck will tour mainside Quantico rucking on streets named after legends of the Corps- Anderson, Catlin, Russell, Meyers, Mullin, Hawkins, Elliot and Quick. The Ruck will pass Marine Corps Base Quantico Headquarters located in Lejeune Hall. The course will traverse a series of roads and trails, through the former Argonne Hills housing area before finishing in the Stadium. The 11.91 mile course is a mix of pavement, improved surfaces and trails ranging from flat to hilly terrain. Recon Ruck participants will be required to carry their own water container along the course. Several refill stations will be available. Runners may participate in the Recon Ruck using hydration packs. All runner and spectator bags brought to the event site will be subject to search. There will be two medical aid stations on event day. Participants should use the clear plastic bag provided at Packet Pick-up to store personal items on event day. Check the bag at the Baggage Area near the start/finish areas and retrieve baggage from the same location after a successful finish. Those participants registered for the Crossroads Challenge should plan to check their packs after the Ruck and before starting Run Amuck. Recon Ruck requires participants to carry a rucksack or other type backpack.The rucksack must contain the prescribed additional weight based on body weight. For participants weighting under 150lbs, ten pound weight is required. For those over 150lbs, a twenty pound weight is mandatory.Weighted vests are not considered packs. In addition, participants are required to carry a water bladder or other hydration system. It is recomended to also have a small basic first aid kit, additional socks and a cell phone. Participants should also carry any nourishment or other gear that they may require. Pack weights should not include these additional items. Packs will be weighed prior to the start and just after the finish. Packs should be compliant with the prescribed weight for the duration of the event. Additional gear may make the pack heavier than the minimum. Participants are required to supply their own packs and weights. The Recon Ruck begins at 6:00 a.m. at Butler Stadium. Belleau Wood 8K will begin at 6:20 a.m. Run Amuck, the mud and obstacle event, will begin at 7:00 a.m. with waves approximately every 25-30 minutes. 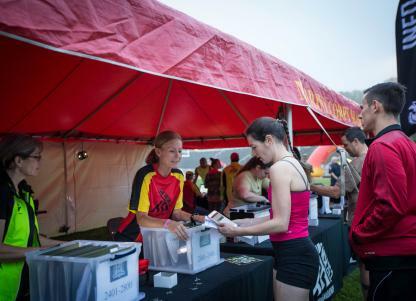 Participants should plan to arrive early in order to have their packs weighed and identified prior to the start of the event. All Recon Ruck participants must maintain a 25 minute-per-mile pace. 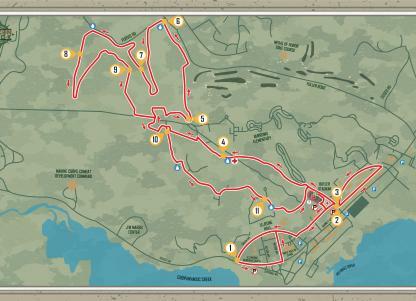 Ruckers may participate in The Crossroads Challenge by completing the Recon Ruck and then Run Amuck. To complete the Challenge, participants must maintain an 18 min/mile pace for the Ruck portion of the event. This allows time to return to the finish to begin Run Amuck. Once participants finish, they will proceed to reweigh their packs where they will receive their newly earned patch. Crossroad Challenge participants may choose to receive their patch at the conclusion of both events. In addition, participants will receive hospitality to include beverages and recovery snacks. On event morning, the first place male and female finisher of the Recon Ruck will receive gold replicas of the Marine Corps War Memorial. First place, Marine Corps bulldog awards will be distributed after finisher data has been verified. Parking is available in multiple locations near the start and finish line. Signs direct participants to these lots from both exit 148 and 150 off I-95. Runners may not park in the lot at the Crossroads Inn on Russell Road or the Barber Physical Activity Center (BPAC). Lejeune Parking Lot - Use 3242 Catlin Ave for map directions. MCCS Semper Fit Headquarters - Use 3044 Catlin Avenue for map directions. Newlin Hall - Use 3255 Meyers Ave for map directions. Naval Health Clinic Quantico - Use 3259 Catlin Ave for map directions. Gravel Lot - Follow Traffic Circle around and turn left on Catlin Avenue at the stoplight. Entrance on the on the right off Anderson Avenue. From I-95 South - take Exit 148. Turn left on Russell Road. Proceed 1 mile to gate. Continue 2.5 miles to parking and event area. From I-95 North- take exit 148. Turn right onto Russell Road. Proceed 3/4 mile to gate. Continue 2.5 miles to parking and event area. Friends and family members are welcome and encouraged to cheer their rucker. Spectators have multiple opportunities to see the Recon Ruck, all conveniently located near Butler Stadium. After viewing the runner cross the start line, spectators should exit the back of the Stadium. At Anderson, spectators can see ruckers around mile 2 as well as the start of Belleau Wood. Moving a short distance to John Quick Avenue, spectators will see their ruckers just mile 3. Spectators can then choose to see the Recon Ruck on McCard Road on their return near Mile 11 or they can choose to return to Butler Stadium to as runners approach the finish line. 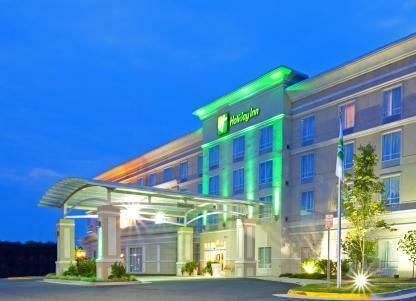 Minutes away from Marine Corps Base Quantico and the Recon Ruck course, the Holiday Inn Quantico Center is dedicated to help make runners' stay unforgettable. Ruckers must present the E-card at Packet Pick-up either printed out or displayed on phone to obtain the official participant bib and technical shirt. Recon: Military term for inspecting or exploring an area. Ruck: a march or walk covering a long distance while carrying a weighted pack. Recon Ruck is held aboard Marine Corps Base Quantico.